This may or may not be obvious but mobile phone signal travels in waves - similar to radio, light and even sound. With all of these, things can get in their way. Like when your car radio drops out in a tunnel. It’s the same with mobile signal. Ideally it will get to your building in a straight line. If not, it might still be able to bounce off things and get there. And once it gets to your house, it’s still got to get through your walls. Now think about different types of sound. High pitched, medium and low pitched. Scientifically, you can term this as being high, medium or low frequency. When you’re inside a building and there’s people in another room or a TV is on. What can you hear? It’s mainly the bass. Or in other words, the low frequencies are better at getting through your house's building materials. Frequencies are key for mobile signal too. The next section explains why. In the UK, there are four actual mobile networks. These are EE, Vodafone, O2 and Three. All other providers just use one of these to bring their customers signal (companies like BT, Virgin, iD and Tesco do this). Each mobile network has masts, which transmit signal to the surrounding area. And there’s a few different basic types of signal that you’ve probably heard of: GSM, 2G, 3G and 4G. 2G and 3G are crucial for phone calls, text messages and internet data (mainly 3G). While 4G is mainly used solely for high speed data. Although some providers and phones now have technology for calls over 4G too. 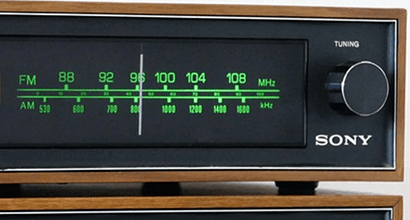 What you might not know is that different networks broadcast these on different frequencies. In other words, some will have 2G/3G that’s better at getting indoors and others will have 4G that’s better in buildings. On a basic level, for calls to have the best chance of getting through your walls to avoid having no mobile signal at home, you want it to be on a low frequency (just like the bass of the TV you hear). 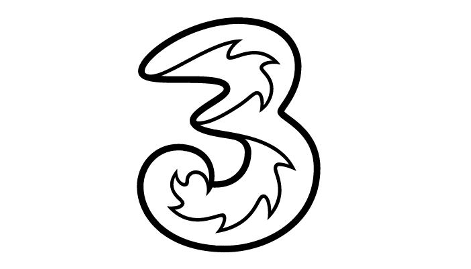 So you could look at the frequency info for each mobile network and see that O2 and Vodafone both send their 2G/3G call signal at a low 900 MHz frequency, while EE and Three’s is higher at 1800 Mhz and 2100 Mhz. Unfortunately, it’s not quite as simple as saying that means O2 and Vodafone have the best indoor coverage (although there is some truth to it), because there are few more things at play. Imagine the TV is turned up louder. You’d hear more detail. So a closer high-frequency mast could still get through your walls better than a further-away low frequency one. And because EE and Three both support calls over 4G, which they broadcast at even lower frequencies, it’s even less simple. Plus there’s technologies like WiFi calling too. So what should you do? Read on! Where to next in this guide? We're going to talk you through some alternatives later but really and truly the proof is in the pudding when it comes to mobile signal. Ultimately, it's best to test a network on a real life phone in the place you'll use it. And there's a way you can do this, without having to spend any money. All you need is an unlocked phone. And then order a free pay as you go SIM from each provider online. You don't even need to buy credit. Once you've received the SIM card, put it in your phone at the location you want to test. Let the SIM card register on the network (should take a few mins) and then make sure WiFi is off (so it can't use WiFi calling). Look at how many bars of signal your phone has got and get a friend to ring the phone number supplied with the SIM to test the call quality. Or call the network's free top up line if there's no one around to call you. If all works well, you know that network is safe to join on a pay monthly deal. In most cases, you could also join one of the providers that use their network too (see here for a breakdown of your options). 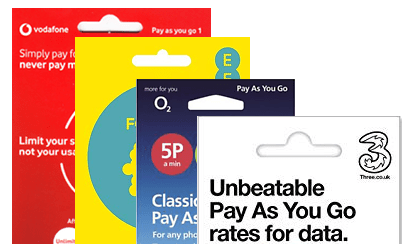 If you're feeling a little bolder, or you're relatively sure a particular mobile network will have decent indoor reception for you, then you can go down the route of ordering a pay monthly deal without testing first. Every pay monthly mobile network must let you cancel a deal within 14 days of the start of your contract (although they do have the right to charge you for your usage up until the point you cancel). What this means is that you could speculatively take a SIM only or smartphone contract to give a proper signal test indoors. But in the knowledge that you can cancel it (phones have to be returned in unused condition). Whether this approach is right for you comes down to personal preference. It's a quick way to answer whether a network has good signal in your house but you do risk locking yourself into a contract if you forget to cancel. We can help you find a cheap pay monthly SIM only or phone deal using the links below. 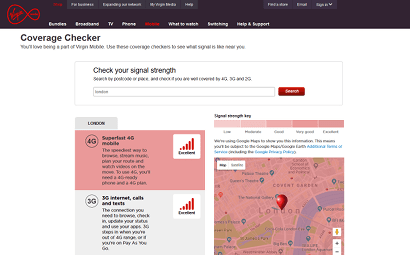 If you're unwilling or unable to order a SIM card to test each network's signal strength within buildings, there are some online resources that could help you predict up front which mobile providers might be best. 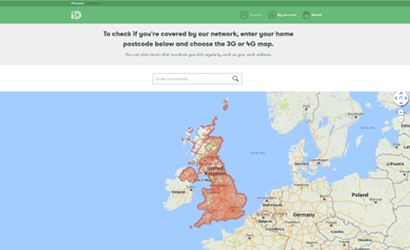 The government regulator Ofcom have an indoor signal checking tool, which lets you input your address and see their predictions for each mobile network's outdoor and indoor coverage. It's a pretty useful tool to do a top-level search but there is lots of missing information, as it's based on data provided by the mobile networks voluntarily. It's not 100% conclusive. And we've found inaccurate results too. 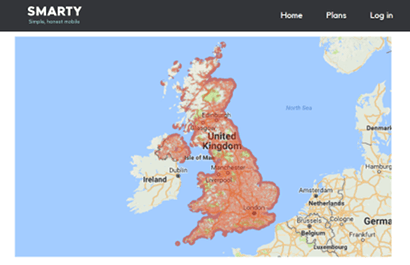 If you want to go even more technical you can look at mastdata.com's database of mobile network mast locations, to check if your provider has 2G/3G transmitters near enough to your house, and what frequency those are broadcasting on. It's a paid service to get the full information. But you can take out a free 30-day trial with no payment details required. We do have some concerns about how up to date the information is. EE = EE, BT Mobile, Virgin Mobile Asda Mobile, Plusnet Mobile (you may see masts marked as Orange and T-Mobile). O2 = O2, giffgaff, Tesco Mobile, Sky Mobile. Vodafone = Vodafone and VOXI. Three = Three, iD Mobile, TPO Mobile and SMARTY (you may see masts labelled Hutchinson). 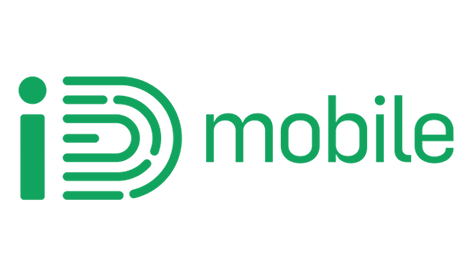 Combine this with our method above of ordering test SIMs and you could be on your way to finding the best mobile network for indoor coverage in your area. If you've read our causes of indoor blackspots section further up this page, you'll see that certain, lower frequencies are better at getting through walls and into buildings. So you want calls to be on those frequencies. Some networks' 2G and 3G signals are on higher frequencies. This lets more people connect at once but makes it harder to get indoors. Meanwhile those same networks are broadcasting 4G on lower frequencies. While this lets their 4G get in, the problem was that it couldn't previously be used for making/taking calls. But more modern phones and selected mobile networks now support calling via 4G (VoLTE/supervoice). Even networks who didn't have this problem with fequencies benefit. Because the more frequencies you can use for calls, the more chance of your signal getting inside more types of buildings. 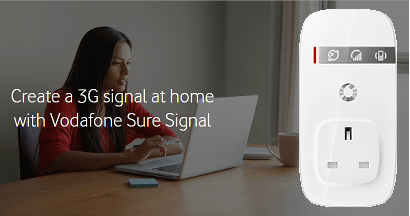 If you have a problem with not being able to make calls inside, picking a phone and mobile network that have 4G calling enabled could be the answer to boosting the indoor signal in your house or building. If your building is somewhere that mobile signal struggles to get inside but is somewhere that has WiFi, then WiFi calling could be another option for solving lack of calls due to indoor blackspots. In a nutshell, WiFi calling lets your phone connect into a mobile network via a WiFi connection, rather than conventional mobile signal. You can make and take calls in the normal way on your regular number. It's similar to 4G calling, in that only certain mobile networks support it and you'll need a phone that has the feature. We recommend checking in advance with a network that your model is supported, as it varies a lot. In many ways WiFi calling is even more useful than 4G calling, because it can work in places where even the best mobile signal has zero chance of getting to, like on the London Underground. It certainly beats the faff and expense of buying an old-school mobile signal booster. There was a time a few years ago when the only available cure for bad indoor mobile signal was to get a signal booster, a box that uses your home WiFi to create a mini 3G transmitter in your house. It was only ever the main networks that offered these and you often had to complain or beg them to give you one. You might even have to pay for one (which we find a little unfair). If your phone and network support WiFi calling, a signal booster is unnecessary. But Vodafone do still sell a signal booster called Sure Signal for a one-off cost if you don't have that option. To be honest, we think it's only really worth going down the route of getting one if you've tried everything else on this page and still come up with no joy. Looking at what frequencies each network carries their 3G calling signal on, Three are at a slight disadvantage broadcasting on a higher 2100 MHz frequency, which will make harder work getting through walls. That's not to say there's no chance. The nearer you are to a 3G mast, the better it'll be able to get through. 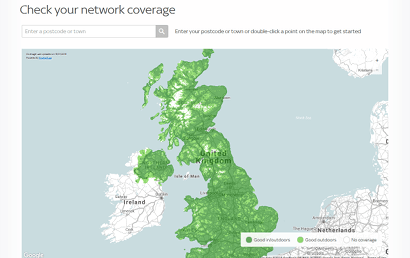 See Three's network map here and Ofcom/Mastdata to check the strength of their 3G calls signal where you go. 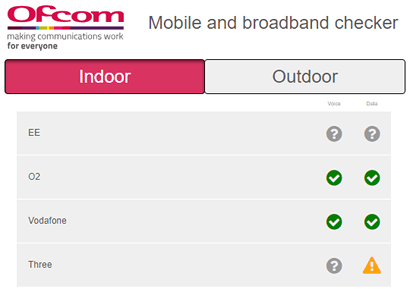 To work around any difficulty of their 3G getting indoors, Three have been one of the leaders in VoLTE (4G calling). Their 4G Supervoice uses their low frequency 4G signal to get into buildings (read Three's instructions here to make sure your phone will work with it). On top of that, they also have the most flexible WiFi Calling scheme called InTouch. Even if you have an old phone, there's an app that will allow you to make/take calls via your regular number (read more here). If you're not confident, there's always the option to order a free Three pay as you go SIM that will let you test. Or if you want to go straight for a contract, Three offer the same 14-day returns policy every network must. 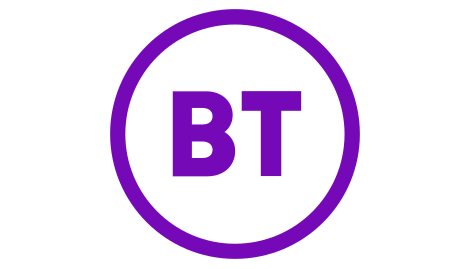 On the face of it BT Mobile don't use ideal frequencies for getting the 2G/3G for phone signal into buildings, 1800 MHz and 2100 MHz (EE's network). Lower than this would be more favourable. If you have a phone that isn't supported by WiFi calling or 4G calling (check the "Is my phone compatible?" FAQs here and here), there's a lower chance of decent indoor signal but we wouldn't write it off completely. 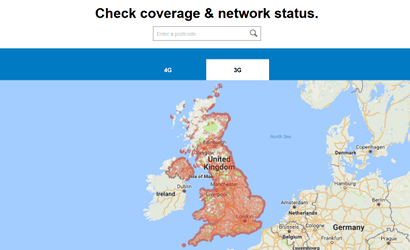 You still have the option to check local masts and predicted coverage using Ofcom and mastdata.com methods above (also use BT's network map to check if you're near 2G and 3G masts). There's no option to get a free pay as you go test SIM from BT Mobile (although their pay monthly SIMs do let you try them for 30 days and return if you're not happy). The most conclusive way to test EE's indoor mobile signal is just to order one of their free pay as you go SIMs. Put it in your phone and get someone to call you where you want to test (4G calling won't work though). 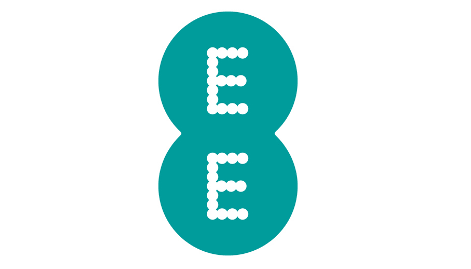 EE actually use some of the less suitable frequencies for regular indoor call signal (1800 MHz and 2100 MHz). But if you have the right phone, and join on a pay monthly plan, you'll get access to 4G calling and WiFi calling. As some of EE's 4G is broadcast on lower 800 MHz, having 4G calling should give you a better shot at strong signal inside. Check your phone is supported by EE here in their help section. 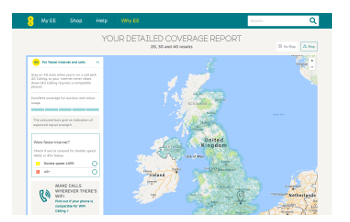 It's worth using EE's network map and/or the resources from Ofcom and mastdata.com to check what types of masts EE have in your local area, and their proximity to your building. 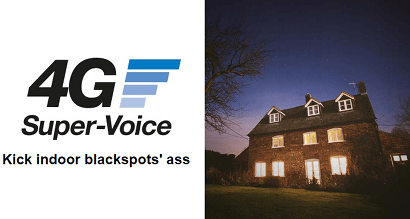 Using the O2 network gives giffgaff a natural advantage with indoor reception for phone calls, because the 2G and 3G signal it uses for calls is mostly on a low 900 MHz frequency (sometimes 2100 MHz though). 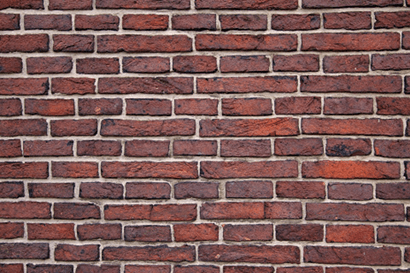 As we say in our section on the causes of indoor blackspots, the lower frequency, the better it generally is at penetrating through building walls. 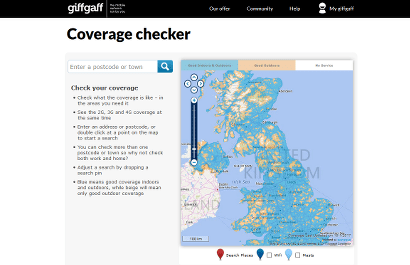 It's important to make sure you're in a good area for 2G/3G coverage on giffgaff (use their network map here to confirm), because they don't have 4G calling or WiFi calling to help out, even though O2 do. 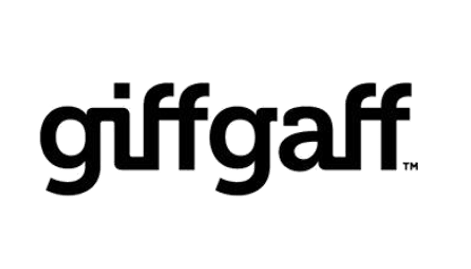 You can order a free SIM card from giffgaff to test but you'll need to top up in order to activate it (you can get £5 free credit with a £10 top up here). For a truly free way to test see O2's PAYG SIMs. The Three network that iD Mobile uses doesn't naturally run on the ideal frequencies for having the best chance of decent signal for calls indoors (their 3G is on high frequencies). That needn't be a problem if you live close enough to a Three antenna anyway (check via this page at idmobile.co.uk). But if it is, then iD Mobile have other solutions that can help. iD are one of the few low-cost (virtual) operators to offer both 4G calling and WiFi calling. This helps because lots of their 4G is broadcast on the indoor blackspot busting 800 MHz frequency. As with other networks iD's WiFi calling and 4G calling is subject to your phone being support (see their guide here). iD don't have free test SIMs to order but you can get one from Three directly without paying. 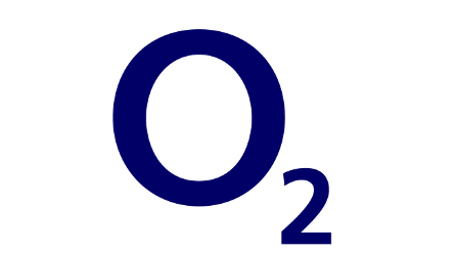 As long as you take a pay monthly deal, O2 are one of the best equipped mobile networks to be able to make and take phone calls inside (some of the extra features don't work on pay as you go plans though). To start, the 2G and 3G signal that carries regular calls on O2 is mostly on a nice low 900 MHz frequency, giving it a good shot of getting through walls into buildings, without the need for extra technology. But if that does struggle to get in, it's backed up by 4G calling and WiFi calling options on pay monthly plans. As with all other providers, you'll need a phone with the right software installed on it, and O2 are little more restrictive than others (see their guide here). You're also in the position to order a free test pay as you go SIM card from O2. But bear in mind this will only test if calls work via 2G and 3G indoors, because neither WiFi calling nor 4G calling work on O2's PAYG. 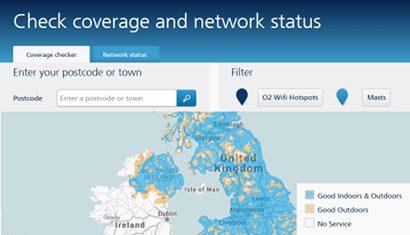 Using EE's network is an advantage for Plusnet Mobile customers in terms of the amount of UK landmass with good outdoor 4G coverage but the high frequencies used to carry phone calls aren't optimal for getting inside. And unlike EE and BT Mobile (who use EE), Plusnet don't give their customers the extra features 4G Calling and WiFi that could get round any indoor coverage problems, if they exist. That doesn't mean you should discount them entirely, because if the buildings where you want signal are near a 2G/3G transmitter, there's a decent chance of call signal getting in (see Plusnet's network map). Ultimately, we'd recommend doing a real life test if you're unsure. Plusnet don't do a free pay as you go SIM, so you could order a free one from EE, do a test and then go back and order from Plusnet. 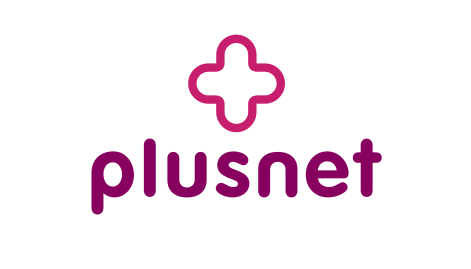 Or you can take advantage of Plusnet's 14-day returns policy and cancel a SIM you take from them if you find it doesn't work to your satisfactions (you may still have to pay for usage in that period). If you didn't know, Sky Mobile uses the O2 network for signal, which we've already explained above lends itself better to getting into buildings because 2G/3G phone calls are mostly on low 900 MHz frequencies. But unlike being on O2 directly, you don't get the advantage of 4G Calling on Sky Mobile, because they don't support it. That's a shame because it's another weapon in the armoury against blackspots inside buildings. They do have a limited WiFi calling facility though. The list of supported phones isn't huge, and you'll need to have bought your handset from Sky to guarantee it'll work (see their help section here). 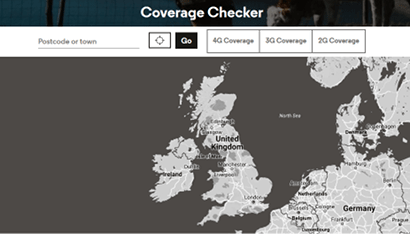 They do provide a prediction of your indoor coverage on their network map here, which we'd recommend checking in advance. Mastdata will show you where nearby O2 transmitters are too. 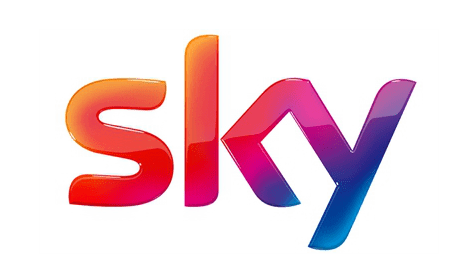 There's no free PAYG SIM on Sky to use for a proper test (you could get a free one from O2 directly and come back to Sky). If you're confident, you could order a contract and cancel within 14 days if you're not satisfied. 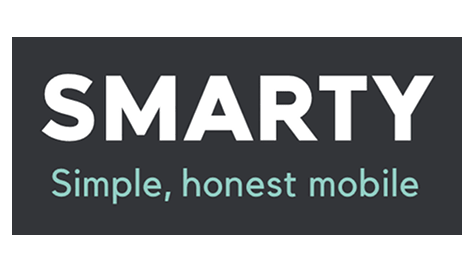 On the face of it, the higher 2100 MHz frequency that SMARTY uses on the Three network for carrying phone calls via 3G has a lower chance of getting indoors than other providers. It doesn't mean they're a complete write-off. If the buildings you want signal in are near enough their 3G transmitters, it's still got a healthy shot at getting inside to let you make calls. 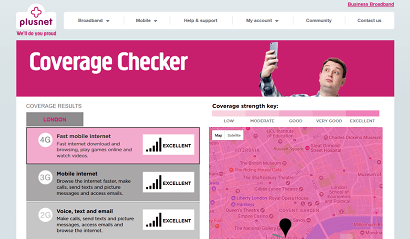 Use SMARTY's coverage checker here to find out their 3G signal strength where you want to use your phone. And use Ofcom and Mastdata's maps to check proximity to your nearest antenna. Failing that, you could do a robust test by ordering a free pay as you go SIM card from Three themselves (you have to pay up front on SMARTY) and ensure 4G and WiFi are turned off when you do your test. 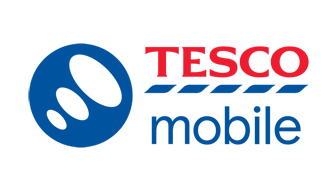 Using O2's network is an advantage for Tesco Mobile because the 2G/3G signals that calls are carried on are on low-range 900 MHz frequencies that should do a better job of penetrating buildings. 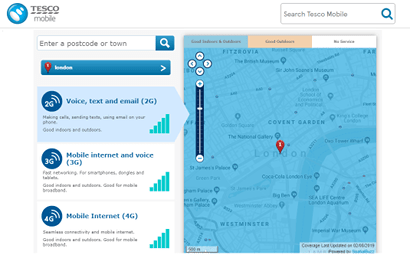 That's a good job, because Tesco don't currently support extra network features that boost your indoor coverage like 4G calling or WiFi calling (O2 have this if you join them directly on pay monthly). As with all networks, if you want to check in advance before committing to their official coverage checker here predicts your indoor signal strength. And Ofcom and Mastdata's maps are useful too for an independent view. You can also order a free pay as you go SIM card from Tesco too for testing. Or utilise the fact that you can cancel a contract within 14-days if you're not satisfied anyway (check full returns policy here first). Using EE's network is excellent for 4G download speeds on Virgin Mobile but it does mean the 2G/3G signal used for calls is on 1800 MHz and 2100 MHz, which generally is less-suitable for getting through walls etc. And Virgin differ from EE and BT Mobile (who use EE's network), because they don't offer 4G calling or WiFi calling as a backup if that 2G/3G signal can't get through (calls don't work on 4G). 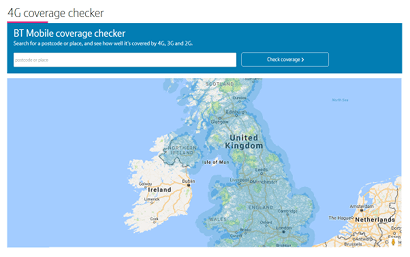 If you're close enough to EE's 2G/3G transmitters this won't necessarily be a problem (Virgin's coverage checker here predicts signal strength in each postcode). You can use Ofcom/Mastdata to find out too. 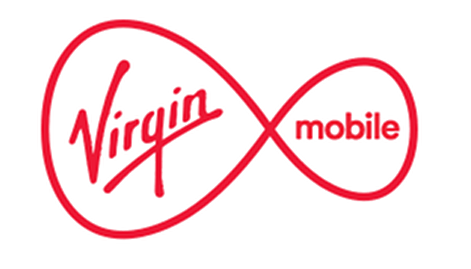 If you want to test out Virgin Mobile's coverage for real, you can order a free pay as you go SIM here and get a friend to call you or ring the top up line. 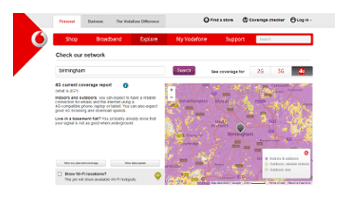 Alongside O2, Vodafone are one of the networks with the most amount of tools at their disposal to get you good mobile signal for making calls where you're indoors. This is thanks to a combination of their calls being transmitted over nice-low 900 MHz on 2G and 3G, which has a better chance of getting through walls and other building materials than higher frequencies. Additionally, if you join on a pay monthly SIM only or phone contract (not Vodafone Basics), you'll also benefit from Vodafone's 4G calling and WiFi technology too (make sure your phone is supported up front though). The combination of all the above should make Vodafone one of the better choices for indoor coverage. Check you're in a strong area for their signal using their map here. And remember you can order a free test SIM too. 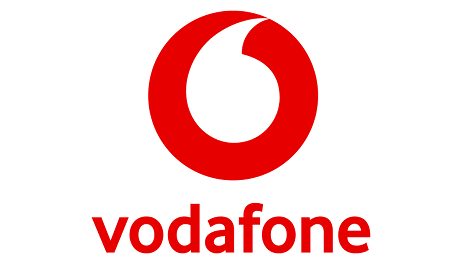 Or you can order a phone contract or SIM only deal from Vodafone and take advantage of their 30-day Network Satisfaction Guarantee, which lets you cancel your contract within 30 days if you're unhappy with their network. As explained in the section about Vodafone, using the low 900 MHz frequencies for 2G/3G phone call carrying signal is a good thing for getting inside. VOXI use Vodafone's network, so you get that same advantage. Where VOXI have a disadvantage over their parent is that they don't yet offer WiFi calling or 4G calling. These make good backups if the regular signal doesn't penetrate into your building. You can't order a VOXI SIM card to test without actually paying for a plan first. So if you want to test what your experience would be like for free, order a Vodafone PAYG SIM and turn off WiFi and 4G calling. 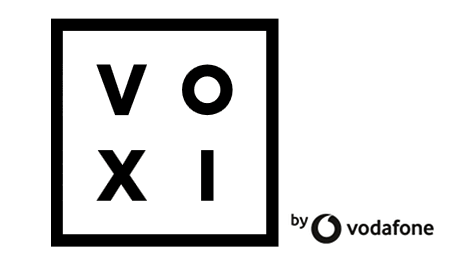 You can also try and predict VOXI's indoor coverage where you are by using their network map here and checking 2G and 3G strength near your building. Or look at Vodafone's results on Ofcom and Mastdata's maps.